The first gathering of New Zealand's epiphyte experts was held in New Plymouth over the 21-23 of February 2013. A full day of presentations was opened by keynote speaker Professor Gerhard Zotz with a thought-provoking review of international epiphyte knowledge. The following presentations covered vascular and non-vascular epiphytes in many different contexts including ecology, biogeography, physiology, restoration ecology and research methodology. Please visit the "Workshop presentations" page to view a PDF of each presentation. Two field trips were held during the workshop. The first was to the semi-coastal urban forest of Huatoki Scenic Reserve in New Plymouth. 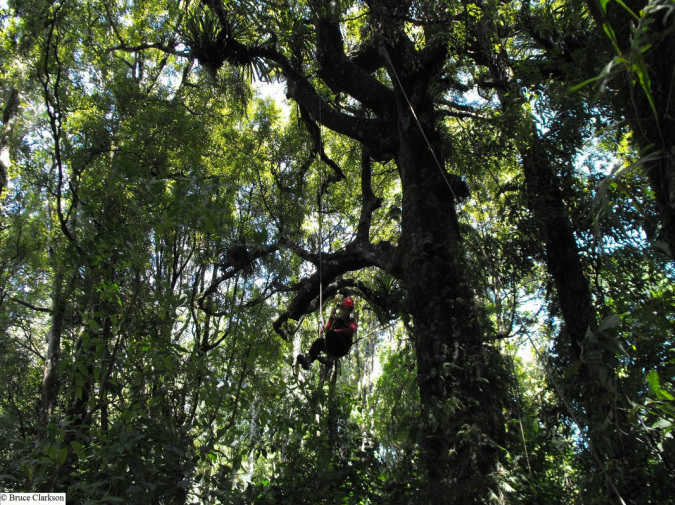 Workshop attendees got to see abundant epiphyte and vine populations not only from the ground but also up close and personal by climbing 15 metres up a large tawa. Thanks to aborist Andy Barrell for providing this amazing opportunity. University of Waikato student Olivia Henwood climbing a large tawa in Huatoki Scenic Reserve, New Plymouth. The second field trip explored many different forest types of Taranaki. 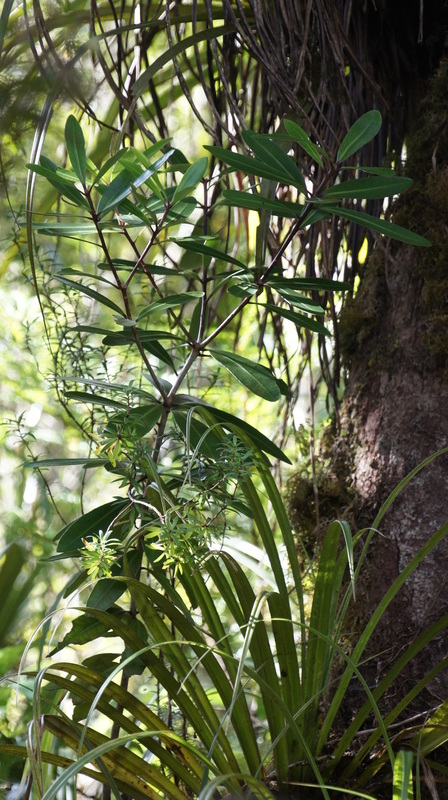 The group started in the dense lowland forest near Potaema wetland where delegates discovered many flowering Astelia solandri as well as the threatened shrub epiphyte Pittosporum kirkii. 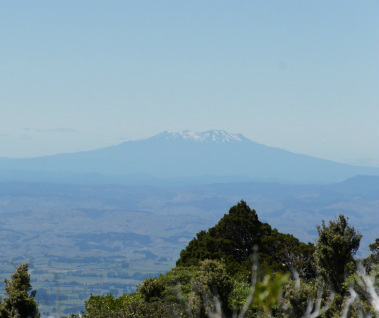 Stunning views of the Taranaki ring plain and central North Island were then enjoying during a tramp up to the Mt. Taranaki treeline. This was where the highest growing vascular epiphyte in the region, Notogrammitis angustifolia subsp. nothofageti was successfully located on a Brachyglottis elaeagnifolia shrub. 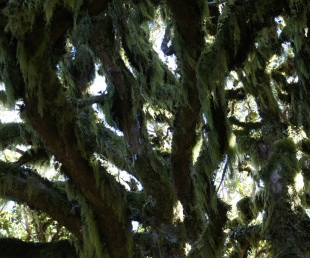 Attendees then explored the moss and lichen laden trees of the Mt. Taranaki cloud forest. Although the forest was unusually dry due to drought conditions, most epiphytes appeared to be coping. The only severe wilting was observed in a few Coprosma species that were occupying an "accidental epiphyte" habit. Moss-laden kamahi in the cloud forest of Mt. Taranaki. The final stop in the exploration of Taranaki forest types was at the edge of the Egmont National Park near Rāhiri Cottage. 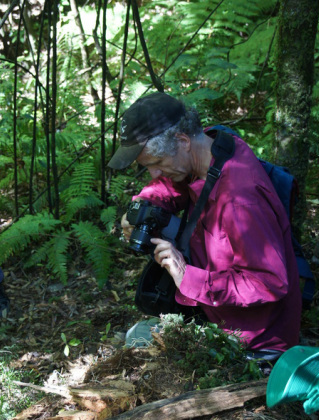 Here the group came across a large clump of fallen epiphytes that allowed close-up inspection of Asplenium polyodon, Winika cunninghamii, Microsorum pustulatum, Cardiomanes reniforme and Astelia solandri. 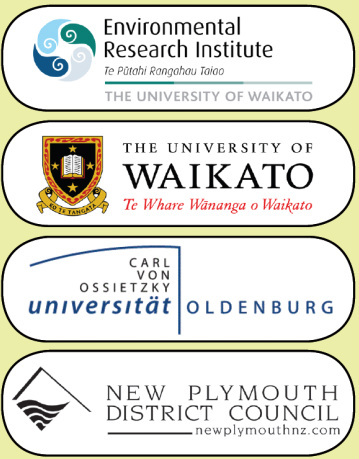 Representatives from many organisations attended the workshop including the Universities of Waikato, Auckland, Victoria, Otago, Lincoln and Oldenburg (in Germany), the Department of Conservation, New Plymouth District Council, Taranaki Regional Council, Auckland Council, Landcare Research, NZPCN, Ngāti Whātua o Ōrākei, and local community groups. The workshop was made possible by the Environmental Research Institute at the University of Waikato, the University of Oldenburg, and the New Plymouth District Council.